174 Commonwealth is located on the south side of Commonwealth, between Dartmouth and Exeter, with 172 Commonwealth to the east and 176 Commonwealth to the west. 174 Commonwealth was designed by Lewis and Paine, architects, and built in 1893-1894 by building contractor Luther Moore Merrill, for speculative sale. He is shown as the owner on the original building permit application, dated July 27, 1893, and the final building inspection report, dated March 23, 1894. Luther Merrill purchased the lot for 174 Commonwealth on April 5, 1893, from architect William G. Preston, buying the land as trustee under the will of his father, Silas Whiton Merrill, who also had been a builder in Boston and had died in April of 1890. William G. Preston had purchased the land on January 29, 1886, from Charles Whitney, who owned the Hotel Vendôme (in 1870-1871, William G. Preston had designed the original portion of the Hotel Vendôme for its first owner, Charles Wood, but did not design the large addition built for Charles Whitney in the early 1880s). The deed from Charles Whitney included language limiting the height and depth of any building erected at 174 Commonwealth so that it would not adversely affect the hotel. 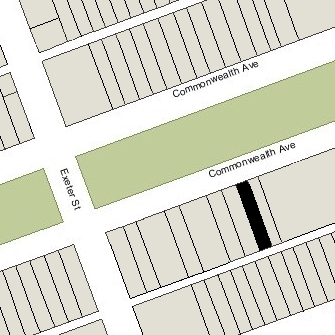 The lot for 174 Commonwealth was part of a larger parcel which included a13.5 foot open lot at the east, between the Hotel Vendôme and 172 Commonwealth, a 20 foot lot for 172 Commonwealth (built in 1885), and an irregular lot for 174 Commonwealth with a 22.01 foot frontage on Commonwealth and a 22.14 foot frontage on the alley. Charles Whitney had purchased the parcel on June 27, 1883, from William T. Hart, who had purchased it from the Commonwealth of Massachusetts on April 7, 1874. Click here for an index to the deeds for 174 Commonwealth. On February 19, 1894, 174 Commonwealth was purchased from Luther Merrill by Sylvia Church (Sampson) Winslow, the wife of coal dealer George Marcus Winslow. They lived at 190 Commonwealth. 174 Commonwealth became the home of the Winslows’ son and daughter-in-law, Winthrop Church Winslow and Virginia (Train) Winslow. They previously had lived at 107 Mt. Vernon. They also maintained a home in South Duxbury. He was a coal dealer in his father’s firm. 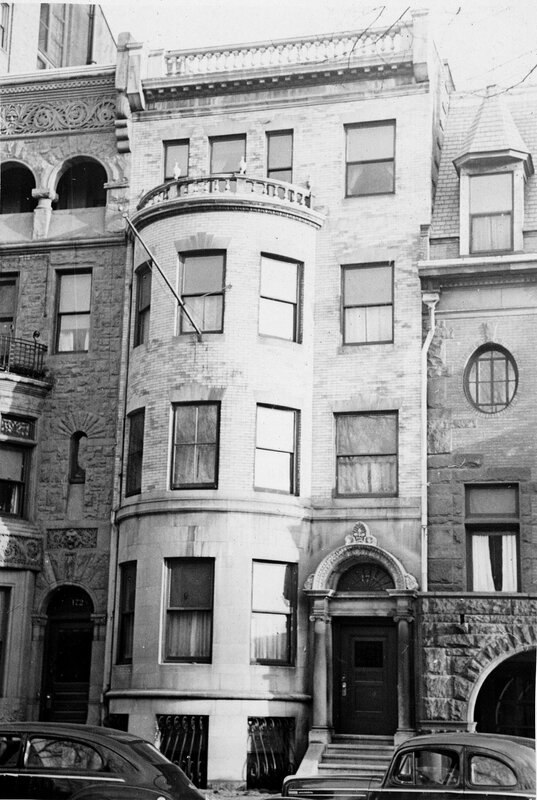 They continued to live at 174 Commonwealth during the 1917-1918 winter season, but moved thereafter to The Puritan at 390 Commonwealth. Sylvia Church (Sampson) Winslow died in February of 1918. 174 Commonwealth was inherited by Winthrop and Virginia Winslow’s daughter, Margaret Winslow, but continued to be assessed in Sylvia Winslow’s name. By the 1918-1919 winter season, 174 Commonwealth was the home of Ellen Louisa (Frost) Meacham, the widow of architect George Frederick Meacham, who had died in December of 1917. George Meacham designed the Boston Public Garden in 1860 and several significant Back Bay buildings, including the Hollis Street Church (1883) at the corner of Newbury and Exeter, and the Boston Bicycle Club (1884) at 152 Newbury. At the time of his death, they had lived at 125 Commonwealth. Living with Mrs. Meacham were Willard Gilman Brackett, a retired shoe manufacturer, and his wife, Fanny Elizabeth (Breck) Brackett, their daughter, Eleanor, and their son and daughter-in-law, Willard and Marthe (Pernon) Brackett. 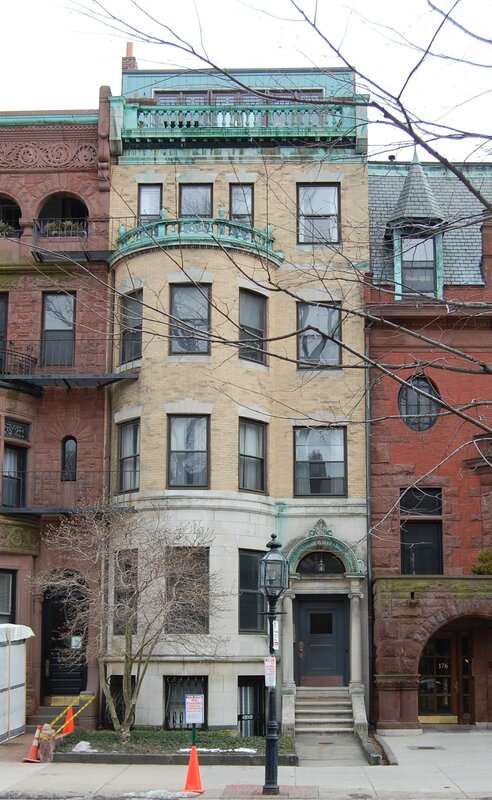 Ellen Meacham and the Bracketts continued to live at 174 Commonwealth in 1924, but had moved to 4 Gloucester by 1925. By the 1924-1925 winter season, Winthrop Winslow had resumed living at 174 Commonwealth, joined by his daughter, Margaret, and his sister, Mary Chapman Winslow. His wife was not living with him, and probably was a patient at Bournewood Hospital in Brookline, where she was living in 1930. Margaret Winslow married in April of 1928 to Francis Cushing Rogerson; after their marriage, they lived in Brookline. On September 20, 1928, she transferred 174 Commonwealth into her father’s name. Winthrop Winslow and his sister, Mary, continued to live at 174 Commonwealth, joined in about 1929 by their unmarried maternal aunt, Elizabeth S. Sampson. They also continued to maintain a home in Duxbury. By 1934, they had been joined by Winthrop Winslow’s brother-in-law and sister, Rev. Walter Reid Hunt and Alice (Winslow) Hunt. Walter Hunt was a Unitarian minister and served as secretary of the American Unitarian Association. Elizabeth Sampson died in February of 1937. Winthrop Winslow and Mary C, Winslow and the Hunts moved soon thereafter to Duxbury. The house was shown as vacant in the 1938 City Directory. By 1939, 174 Commonwealth was the home of Edward Pitman Douglas and his wife, Leona (Valcourt) Douglas, who operated it as a lodging house. They previously had been lodgers at 294 Commonwealth. Winthrop Winslow died in 1940 and left 174 Commonwealth in trust for his daughter, Margaret Rogerson. In August of 1941, Katherine Smith — as lessee from the estate of Winthrop Winslow — filed for (and subsequently received) permission to convert the property from a single-family dwelling into a lodging house. By 1943, she had moved to 61 Marlborough. On January 27, 1943, 174 Commonwealth was purchased from the trustees under Winthrop Winslow’s estate by attorney Roy Frank Kipp. He and his wife, Delillus (Crockett) Kipp, owned and lived at 178 Commonwealth. In March of 1946, Delillus Kipp purchased 172 Commonwealth. They also owned 163 Commonwealth, across the street. In August of 1948, Roy Kipp filed for (and subsequently received) permission to convert 174 Commonwealth from a lodging house into ten apartments (he had made a similar filing in January of 1946 but then abandoned the application). In November of 1957, Delillus Kipp purchased 176 Commonwealth. On March 21, 1970, 174 Commonwealth was purchased from Roy Frank Kipp by Alberta A. Cuddy. She purchased 178 Commonwealth from him on the same day. On March 28, 1975, Daniel M. O’Reilly and I. Bud Herzog, trustees of Rennell Realty Trust, foreclosed on the mortgages on 174 Commonwealth and 178 Commonwealth given by Alberta Cuddy to Walter Angoff and assigned by him to them. 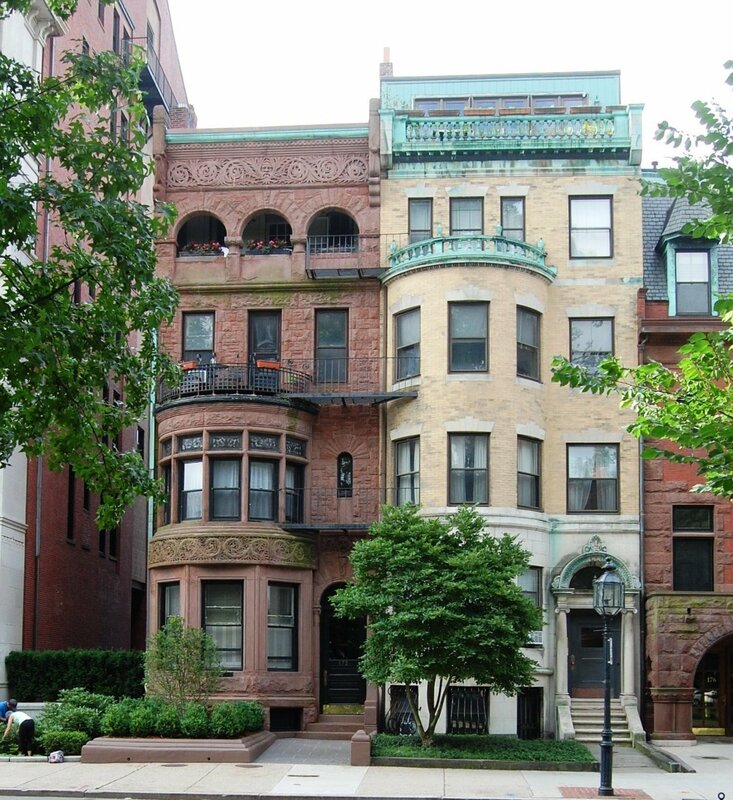 On the same day, they transferred the property to Daniel M. O’Reilly and John M. Nelson, IV, agents and general partners in 174/178 Commonwealth Avenue Associates. On August 16, 1979, they converted 174 Commonwealth into ten condominium units, The 174 Commonwealth Condominium. In October of 1986. Richard J. Morris, a unit owner applied for (and subsequently received) permission to construct a penthouse addition to 174 Commonwealth.